A city located along the Brazos River in central Texas. A group of Wichita Native Americans known as the Huaco resided in the area for thousands of years before the arrival of European American colonizers in 1824, who, under the leadership of Stephen F. Austin, began settling in the area. The Huaco were gradually driven out of the area, and in 1872 were relocated to the Wichita reservation in Oklahoma. The town of Waco grew first around the construction of a bridge over the Brazos River, which served the region's growing population of ranchers and cattle herders. In 1845, the town became home to the first university in Texas, Baylor University. Throughout the late 1880s, cotton was the city's main source of economic growth, but after the arrival of the railroad in 1881, commerce and industry diversified Waco's economy. In 1993, Waco attracted international media attention when U.S. police and military forces engaged in a prolonged, violent confrontation with the armed members of the Branch Davidian religious sect, whose compound was located outside of the city. In response to allegations that the Davidians were holding illegal weapons, the Federal Bureau of Investigation (FBI) initiated a military siege of the ranch. The siege period lasted 50 days, and ended in a dramatic shootout, resulting in a fire that destroyed the compound and killed 76 people, many of whom were women and children. The case remains controversial, as many critics believe the extreme response on the part of the FBI was unnecessary. 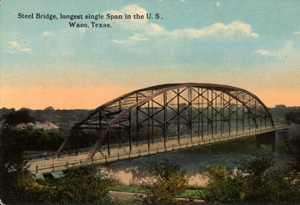 "Steel Bridge, Waco, Texas, circa 1908" by Curt Teich & Co is licensed under Public Domain. 2013 Encyclopedia Britannica Online: Branch Davidians.